Regardless of what your workout plan or regimen is, nutrition always plays an extremely important role in it. It’s especially true with CrossFit nutrition. Because CrossFit involves intensive training sessions that require lots of energy. And we all know well that to generate this energy, our body needs food. Today we’re going to talk about CrossFit nutrition. When done properly, it will help you improve your performance and reach your desired results. We’ll discuss some of the most popular CrossFit diet plans, so you can choose the one that fits you the best. To make it easier for you, we’ll describe all the do’s and don’ts of each diet, and show you sample eating plans. Apart from that, we’ll also share general advice and suggestions on a CrossFit diet. As a result, you’ll be able to build your own eating plan to fit all your requirements. You can use plans for a specific diet as a base, or even start from scratch. The main goal here is for you to make the most of the food you consume. So, let’s get started! 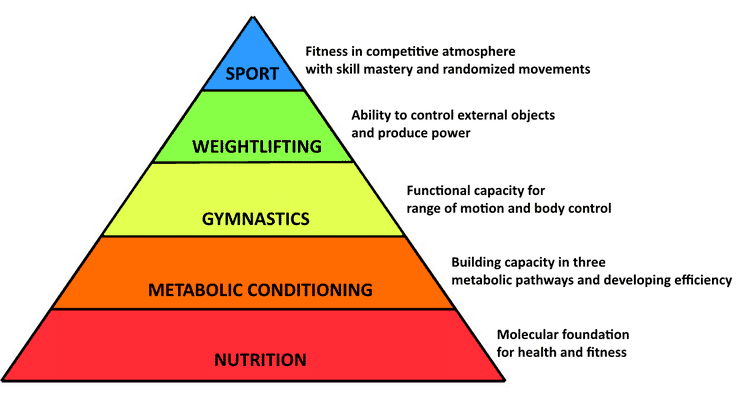 CrossFit and Nutrition. What’s the Connection? Before we discuss CrossFit nutrition plans, it’s worth taking a moment to talk about the regimen itself. Gregg Glassman is the one who created CrossFit. Since the very beginning, in the early 2000s, it has rapidly gained popularity. The program aims at developing strength and conditioning. Its main components are bodyweight exercises, weightlifting, and aerobic exercises. Apart from building strength, it also improves endurance. The program itself is flexible enough to fit a wide range of needs – from just getting fit to increasing your strength. And the base for all this is proper nutrition. Choosing the right diet and eating plan depends on what you want to achieve with your workouts. It’s the same thing as setting up goals when you decide to start the CrossFit program in the first place. In this CrossFit nutrition guide, we’re going to look at 3 of the most popular CrossFit diet plans: Paleo diet, Zone diet, and Flexible dieting. Each of these diets serves a different purpose. 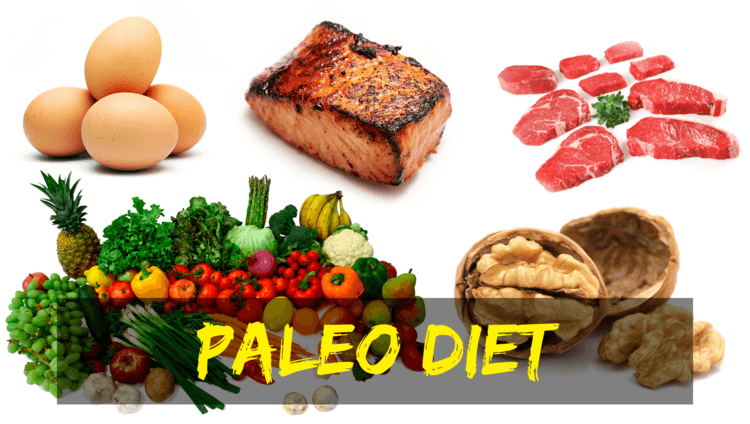 The Paleo diet, for instance, is a great choice if you want to lose or maintain weight with your workout program. This diet is clean and doesn’t restrict you in terms of how much food you need to eat. The only restrictions are for what you eat. On the other hand, the Zone diet is going to be a perfect fit if you’re aiming for maximum performance at workout sessions. This diet plan requires a bit more attention. You’ll need to measure and weigh your food, and arrange the meals so that they have the required amount of carbs, fats, and protein. Finally, Flexible dieting speaks for itself. It’s less restrictive than the Paleo diet in terms of which foods you need to eat. It also includes less counting and measuring than the Zone diet. This is somewhat of a sweet spot between the two diets mentioned above. So, you can try it if you’ve chosen CrossFit for strength and size improvement, or for weight loss. The main objective here is eating the right amount of food. Now, let’s look at each CrossFit diet in more detail, see what you can and can’t do, and check out eating plans. We’ll start off with the diet that’s the least restrictive of all three. Here’s what you should know about it. The core principle of this diet is simply counting calories. But what about those macros? What are they? Macros are fat, protein, and carbs. Fiber is also counted as a fourth macro sometimes. It may seem like a difficult and boring task to sit and try to figure out the amount of calories you need. But, in reality, everything is much easier than you think. There’s a useful calculator that will help you with all the counting. First, you’ll count the overall amount of calories you need for the day. This information is based on your gender, age, height, level of activity, and weight (current and goal weight). 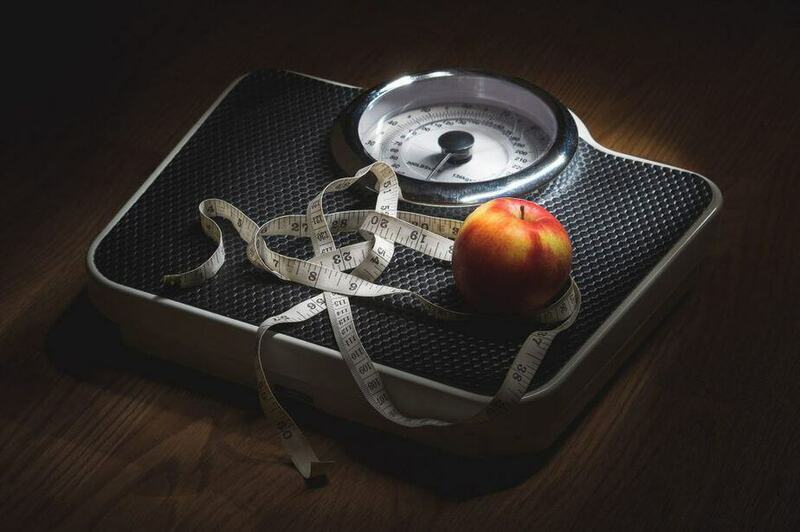 Now you need to decide whether to gain, maintain, or lose weight. And there you have it: you’ve just got your macros. In other words, you know the exact amount of carbs, fat, protein, and fiber that you should eat. Still feel confused? Try using other calculators, like this one (a bit more compact and straightforward), or this one (even more simplistic). The greatest thing about this CrossFit diet is that it practically allows you to eat anything (as long as it fits your macros). It gives you full control of your body weight. And it’s adjustable to whatever workout plan you may choose. It’s perfectly suitable to use as a CrossFit diet plan for muscle gain, or any other objectives. Some even consider it the best diet for CrossFit performance. The drawback is obviously the fact that you need to plan your meals beforehand. And, of course, the healthiness of this diet fully depends on your self-discipline. This is why some people say that you should start Flexible dieting after trying to eat healthy for a certain time. Count and calculate. This goes without saying, but it’s still worth reminding you, and we can’t stress it enough. Counting calories and calculating macros is the very core of this CrossFit diet plan. And all those calculators are there for a reason. You can also make great use of fitness apps like MyFitnessPal. Use a food scale. This will ensure that you eat the exact amount of food you need. Plan your meals the day before you’ll have them. With calculators available, this won’t be a difficult task. And you’ll still be able to make corrections. If you still somehow failed to plan your meals for the day, write down the food you eat before actually eating it. Why? Because when you log the meal after you’ve eaten it, you won’t know for sure what food intake to write down. As a result, you’ll be stuck thinking how to balance out the rest of your meals to hit the target macros. Include CrossFit nutrition supplements. If you consume extra protein, fish oil, creatine, or any other supplements, make sure to include them in your calculations. Mix it up if you can. There’s always space for creativity in a nutrition plan like this. Depending on your goals, you can adjust your diet. Add more vegetables or choose a diet version of a meal so you don’t feel hungry until you have the next one. Don’t stress too much over the numbers. It’s ok to miss macros here and there. As long as your calorie total is close to the expected result, there’s nothing wrong with minor deviations of macros, even if it conflicts with what’s been said in the “Do’s” section. Don’t lose focus. Remember, you’re still on a CrossFit nutrition plan. And even if Flexible dieting isn’t restricting, it doesn’t mean you can consume loads of junk food. Don’t forget about micros. While thinking about how much macronutrients you need to consume, don’t forget about micronutrients, too. Vitamins and minerals are also important for your post-workout recovery. This is another point for eating healthy. Don’t go extreme when timing your meals. We won’t tell you to not eat before bed, to cut carbs by a certain time, or to split your regular meals into smaller ones. This is nonsense. Eating almost nothing throughout the day just to have an epic feast in the evening is still not a good idea. It can even affect your performance at training sessions. So, keep your meals balanced. Read more: What Should You Eat Before Crossfit? A short reminder. 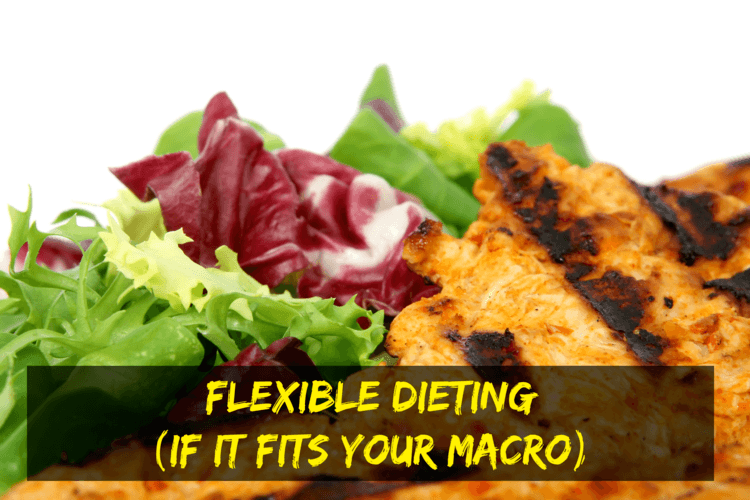 This is just an example of what an eating plan for Flexible dieting can look like. 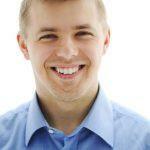 The main reason for this is that each person builds an individual plan, as it was mentioned earlier. But, with the help of this sample, it will be easy to build a meal plan for a CrossFit athlete, as well as for a beginner. The Paleo secret is simple: to try simulating the diet of our ancestors from the Paleolithic era. Even though the realization of this CrossFit nutrition plan can be somewhat of a challenge at first, it will fit you perfectly if your main goal is to lose weight. It’s considered to be the best diet for CrossFit weight loss. The Paleo diet will also be a great choice if you’re completely new to clean eating, because it’s pretty straightforward, and there’s not that much to learn. Yes, there are still some rules to follow. But here’s the thing. It’s still possible to adjust this diet plan if losing weight isn’t your primary objective. But if you want to get rid of as much weight as possible, then you’ll have to follow a strict Paleo diet and pay strong attention to all the “Do’s” and “Don’ts” described below. On the plus side, the Paleo diet food list is quite diverse, and you’ll be eating a clean diet, without chemicals or additives. Apart from that, the Paleo diet also gives anti-inflammatory benefits from all the nutrients from the vegetables, fruits, nuts, oils, and seeds. Iron intake will also increase, as you’ll have enough red meat. Another plus is that this diet improves satiety. You won’t feel hungry between meals, as your fats and protein intake will be high. All in all, we think it’s worth giving the Paleo diet a shot, as even the limit in food choices can improve weight loss. It’s equally efficient both as a male or female CrossFit diet plan. Eat meat. The choice here is huge. Chicken, turkey, duck, beef (including steaks and ground beef), lamb, pork (ham and chops too). You can also have eggs, fish, and seafood. Have it frozen, or fresh. It’s impossible to overeat meat, as it greatly satisfies your appetite. Meat includes compounds that help you recover faster after training. It improves metabolism, which helps to burn more calories. It also improves insulin sensitivity, and includes carnitine, which makes it possible to use fat as energy. Healthy fats. These include avocados and almonds, as well as oils such as coconut, olive, grape seed, and flaxseed oil. Healthy fats have anti-inflammatory properties. They also normalize the omega-3, omega-6, and omega-9 ratios. Healthy fats improve the blood flow, and act as a source of energy. Nuts and seeds. They are nutritious and filling. Nuts and seeds are full of minerals, vitamins, antioxidants, protein, and fatty acids. It’s important to eat them in moderation though, in order not to peak omega-3 and omega-6 ratios. Fruits. But not all of them. Moderation is the key here, too. The reason being that fruits raise your insulin level due to the sugar they contain. Even though this sugar is natural, it may still prevent the weight loss. Avoid artificial sugar. The main reason for this is that artificial sugars spike insulin levels and prevent losing weight. Exclude grains. Grains contain no nutrients and have anti-nutrients instead. They cause bloating and increase weight gain. Grains like oats and wheat have gluten, which lowers the insulin sensitivity. Don’t eat legumes and beans. They include phytates that decrease the intake of minerals. They also contain lectin that affects digestion and allows some bacteria into the bloodstream. No dairy. Again, dairy causes insulin levels to spike. Also, cows are fed grain, which is also nutrient deficient. Avoid junk food and alcohol. Do we even need to say anything about it? 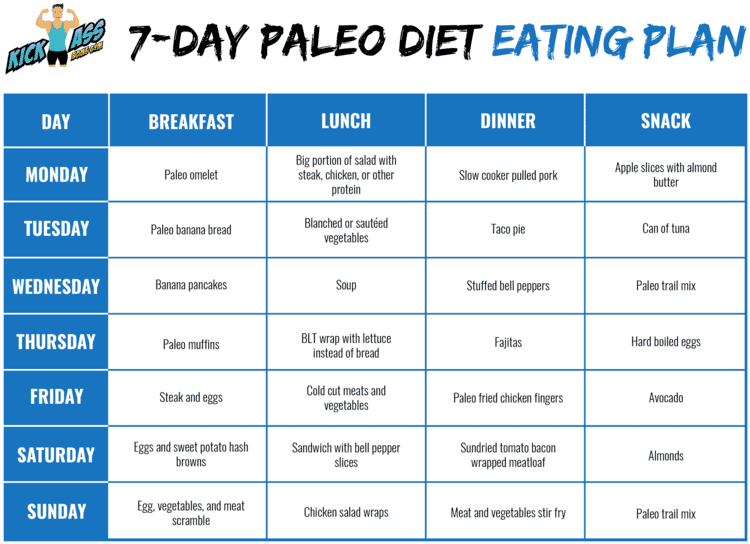 As with Flexible dieting, this Paleo diet eating plan can serve as a sample. You can use it as a base to build one of your own. Or just give it a try to figure out whether this CrossFit nutrition plan works for you. To get more Paleo diet eating plans, go here, here, or here. 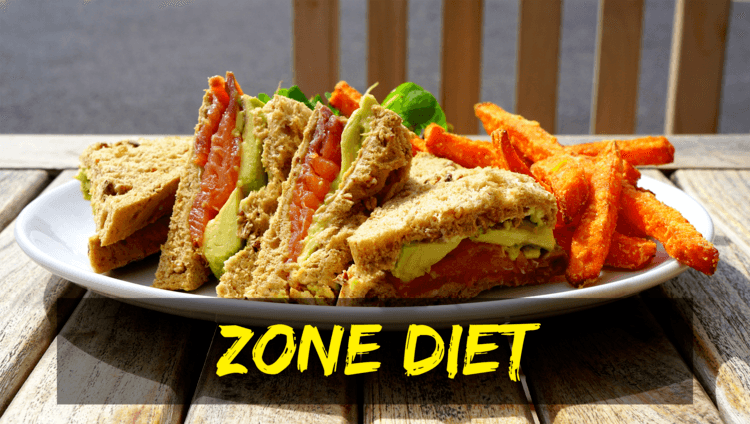 The Zone diet is somewhat similar to the Paleo diet. It’s not that restrictive though, and gives you more freedom in choosing what food to eat. If anything, it doesn’t ban any food. It just discourages eating processed foods and starch. In the Zone diet, all meals are balanced. They consist of 30 percent protein, 30 percent fat, and 40 percent carbs. This CrossFit athlete diet has gained great popularity due to enough freedom of choice and a nice balance. If you were looking for a CrossFit diet plan to lose weight—this might be your choice. But it can serve as a CrossFit muscle gain program, too. How do you maintain balance in your meals? By counting blocks. Ok, what are blocks then? 1.5 grams of fat—makes 1 block fat (though it’s believed that each block of protein already includes 1.5 grams of fat, which means that a 1-block meal will include 3 grams of fat). The key to success with this CrossFit diet is to build a habit of having meals regularly, at approximately the same time. This doesn’t mean that you have to set alarms and have food as soon as it takes off. Just get used to eating within an hour after waking up, have no more than 4 hours break between other meals, and have a bedtime snack. In general, you end up with 5 balanced meals a day. 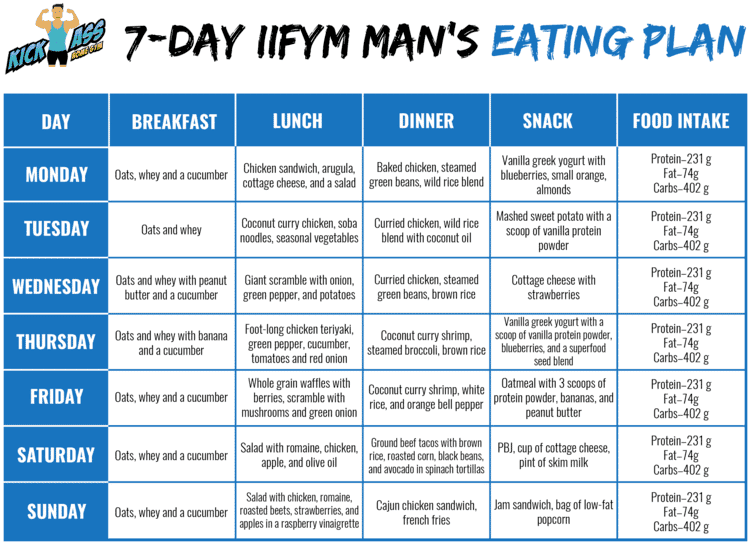 As it was mentioned earlier, this diet is sort of a mix between Flexible dieting and the Paleo diet. You don’t have that many restrictions, but you do have some counting to do. In order to make this task easier, here’s a CrossFit Zone diet calculator for you to try (in fact, here’s another one just in case you don’t like the first). As a result, you receive most of the benefits that the Paleo diet brings, with more varied food choice, and a great balance of macronutrients and micronutrients. Also, it becomes much easier to follow after you learn to properly measure your food and build Zone meal plans. Remember: two snacks a day. One during the day, and one before going to bed. This will keep the scheme of 5 meals a day working, and you’ll get the right amount of calories for your body type. Eat regularly. Missing your meals will drop your blood sugar level, triggering hunger. And compensating a meal that you’ve missed is not a good idea either. Just remember about having 4 hours between meals and you’ll be fine. You can mix things up a little bit until you’ll get used to the diet’s regimen. This means that you can move blocks around throughout the day depending on how hungry you are. One thing to remember is to still keep it within a normal schedule. Use a scale. It’s useful for Flexible dieting, as well as for Zone diet. It will make measuring the right amount of food much easier. Always keep the right balance. This is the very idea of the Zone diet. If you don’t keep your meals well-balanced, then you won’t get the required amount of calories. It just defeats the purpose of following this CrossFit diet plan. Same as with flexible dieting, don’t worry too much about the exact numbers. Let us give you an example. Let’s say that you have a snack bar that includes 29 grams carbohydrates, 8 grams of protein, and 6 grams of fat. In this case, you only count carbohydrates. If you take into account all the mentioned macronutrients, it would mean that you also had 3 blocks carbs, 1 block protein, and 4 blocks fat. But one snack bar obviously isn’t enough for a full meal, and you’ll feel hungry pretty soon. Don’t consume too much high-glycemic carbohydrates. What are those? They’re a type of carbs that rapidly increase the blood sugar level. Candies, sweets, and sodas include this type of carbs. Rice, bread, and potato have it too, but in smaller quantities. We don’t say that you have to stop having them. But we do insist that you consume these products moderately. Building a proper Zone diet eating plan is all about having the right amount of blocks depending on your gender and body type. So, instead of giving you a chart with meals, we’ll show you how many blocks a person needs to have. 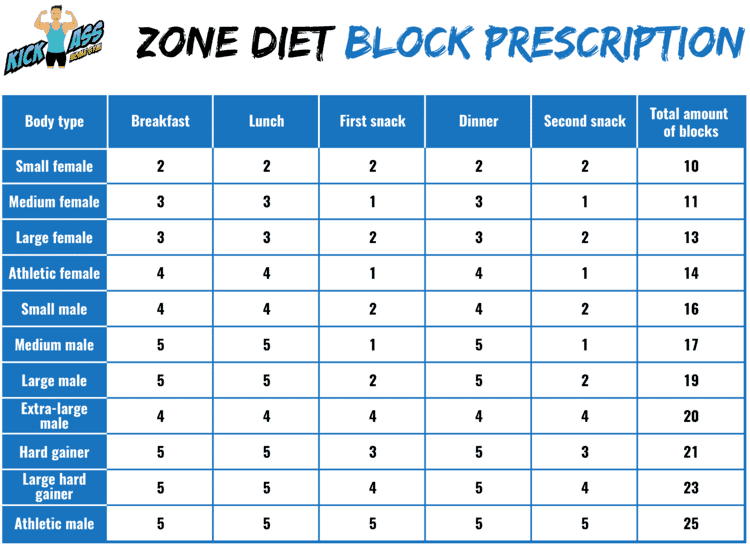 You can find Zone diet blocks charts for fat, protein, and carbs, as well as sample meals in this CrossFit Zone diet spreadsheet. Regardless of what CrossFit diet plan you decide to follow, there are habits that you may or may not have. Some of them are worth developing. And it’s better to leave the others behind. Here are general “Do’s” and “Don’ts” of CrossFit nutrition. Choose healthy snacks. As we’ve mentioned earlier, you need to get the most out of the food you eat. This is also true about the snacks. The healthier—the better. You can even start having them before you decide which diet plan to follow. This way you’ll develop a habit and won’t have troubles with it in the future. If you’re not on a restrictive diet, consider having a bit of dairy every now and then. Don’t consume too much of it. Incorporate it into your diet slowly and gradually. This will help you support your muscle growth. Support your digestion. After starting a certain CrossFit diet, you’ll begin eating more than you’re used to. Help your body to deal with this by having enzymes and probiotics to support digestion. Don’t skip breakfast. Many people tend to be guilty of doing this. Skipping a proper breakfast leaves you hungry and basically breaks any diet plan. Don’t overeat. Overeating can be a direct result of skipping breakfast. Even if you’re eating clean food, what’s the point if you still consume a lot of it in one sitting? Don’t avoid snacks. Eating snacks is another way to prevent yourself from being hungry until the next proper meal. Don’t get distracted while eating. This is where multitasking isn’t a good thing. When you try to eat and do something else at the same time, you’ll usually end up consuming your food too fast. You’ll have eaten your required amount of calories very quickly. As a result, you’ll still feel hungry, because your body didn’t have time to digest it all properly. Whichever CrossFit nutrition plan you choose, just don’t forget your main goals. Remember why you started it all in the first place and you’ll definitely succeed.